I am standing on the stage, rooted to the round red carpet. Even though during rehearsal I was told not to do it I look beseechingly into the wings, almost begging MC Matt Youens to rescue me. I feel like a kindergarten child, told not to move until I am given permission, and while the moment is amazing it is overwhelming me in every way. Finally Matt comes out of the wings at the Suncor Energy Centre for the Performing Arts and hugs me, and I leave the stage. 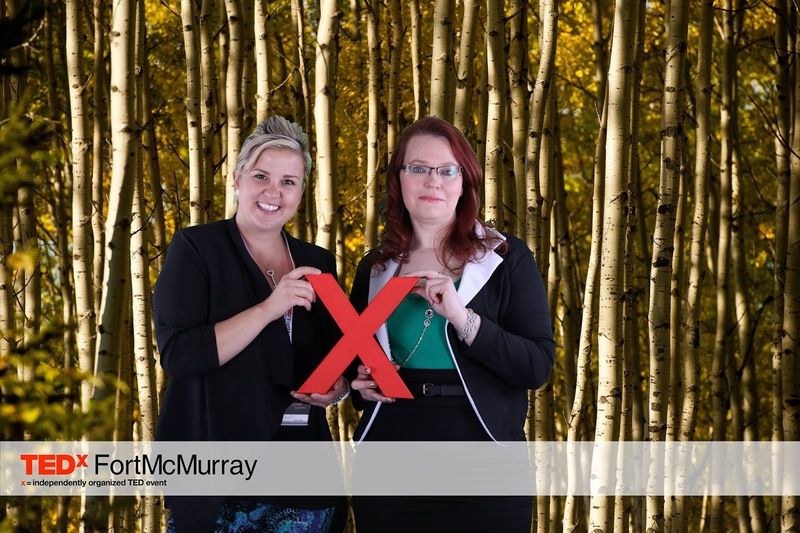 I have just finished my presentation at TEDx Fort McMurray: Shift in Thought – and I am speechless, having left all my words on the stage. I wrote a couple of days ago about the build-up to TEDx – the hours of preparation, and the work involved. I wrote about auditioning and the journey with my fellow presenters. It all culminated in a day I will never forget, a day I was honoured to share with the Intrepid Junior Blogger. We arrived early Saturday morning, and while the day before during the dress rehearsal I had been nervous, on Saturday I was instead quite excited – but with calm nerves. I took the IJB’s photo in front of the big red X outside the doors, of course, and then we entered to find our nametags and register and begin our day. It is remarkable, all the things the TEDx organizing committee managed to arrange for that day. There was the Baby X photo booth, and Speaker’s Corner, built all from recyclable materials by my dear friend Ashley (@ashcakesquiggle on Twitter). I had followed her building journey on Instagram, and I knew the hours she had put into an amazing finished piece where people could pause and record their thoughts from the day. There was the blackboard where you could write some words that inspire you, and, perhaps most intriguing of all, an adult ball pit called “Take a Seat and Make a Friend”, where you got in with a stranger and asked each other some prepared questions (or better yet went off-script and just talked). The IJB and I, however, dove into the delicious muffins and dropped my things backstage, and then went to find seats for the day. We chose seats a couple of rows from the front of stage, because I wanted to be close enough to see and feel every nuance of the other presentations – from those individuals who had become my friends. The IJB and I settled in, and the morning started with amazing artist Lucie Bause, musician Dave Martin, and theatre guru Claude Giroux. I am not going to tell you about their presentations in this post, as I would rather save my thoughts for when their YouTube videos are ready to be watched. All I will say for now is that I was so proud of each of them, as I had seen them in rehearsal and I know the work they put in. It was an incredible start to an incredible day, and as I watched them I reflected on my moment on that stage to come later on. Our day of shifting thought had begun. During the break the IJB and I got our photo done with Baby X, and I recorded a bit in Speaker’s Corner – and then we headed to the ball pit, where the IJB was the very first one to meet a stranger while immersed in small plastic balls. Then it was my turn, and I climbed in with a beautiful young woman, and found what was likely my favourite moment of the entire experience. You see the young woman, Bianca, is new to this community. We talked about a lot of things, but one of the things we touched on is finding your place here. I advised her to find her niche, and to use it as an entry into the community. Just five minutes with her told me that she would quickly find her place here, and that we were lucky to have her because she is one of those people you immediately know will make a difference wherever they are. I have thought about that moment many times since, that conversation with Bianca, and whenever I do I smile because it is perhaps the moment that is most true to what I want to do here – share my love of this community, and find ways to connect with others in it. We returned to the darkened theatre for Act II, which saw Liane Lefsrud, Kevin McNiff, and Alanna Bottrell hit the stage. I was again so proud of them, and delighted to see three more presenters – and friends – find their stride and own that little round red carpet. They delivered their thoughts in front of a tremendous stage set backdrop, one even the IJB commented on as impressive, and they connected with their audience, including me. And then it was lunch time, a lunch packed in reusable containers in picnic baskets, and designed to introduce you to strangers. The IJB and I ended up at a table with three others, one I know well (fellow blogger and new Director of the Arts Council Wood Buffalo Russell Thomas), and we shared thoughts on the day thus far (as well as some delicious picnic fare, food that was the perfect fit for the day, and obviously lovingly prepared). After lunch we headed backstage where I changed into the clothes I would wear to present, including my self-designed, custom-made shoes from Australia (more on those in a later post, too! ), and snuck back into the theatre for Act III. Act III focused on Amie Dawe and Brent Hughes, who both spoke about a shift in thought of the more practical nature, and compelling ones at that. Once again I found myself proud and pleased, although now I was also something else. I was nervous. After Brent finished I led the IJB outside, and I hugged her. I found my coach Joelle, and we headed backstage. The lovely Ruby, our volunteer make-up artist, applied some basic shade to my no-doubt pale with fear face, and I kept up my usual patter of jokes and nonsense, hiding some very real nerves. Sean, the very calm theatre technician, helped me mike up – and then it was backstage in the wings with Rolando and Joelle, to wait for Matt to introduce me. I don’t know how to describe that moment as I waited in the wings alone, collecting myself. I don’t even recall what Matt said when he introduced me, or walking out on that stage. I do recall looking up into the audience and catching sight of two familiar faces that gave me courage, and then launching into the twelve minutes that I had never written down. Yes, I had never written that speech down, not even before I auditioned. Someone asked me how long it took me to write the speech, and while I said I had never written it that isn’t really true, I guess. The real answer is that I have been writing that speech my entire life, because it is, in the end, the narrative of my life. I am not going to tell you what I said. I will share the video when it is ready, and I will tell you then a bit more about it. To be honest, though, I remember very little of my time on the stage, although I am told I hit all my key messages, and spoke clearly. I was so in the moment, though, that I have very little recollection of it...until the final moment when I finished and the unexpected happened. I said thank you, and the audience began to clap – and rise to their feet. I have never experienced a standing ovation. I had not cried until that point, had not felt the sting of tears, until I saw people rising from their seats to applaud. I was overwhelmed, and began to look longingly into the wings, wishing for Matt to rescue me, but he refused, ensuring that I enjoyed that moment. When I left the stage it was to find hugs and kind words from my coach and Rolando, and then quickly backstage to kind words from those gathered there. I stopped quickly in Speaker's Corner to record my very raw and fresh thoughts (and I have absolutely no recollection of what I said, so I desperately want to see that video, too). My coach and I snuck back into the theatre to catch the presentation from the adorable Katie Long, and the final presentation from Jenny Berube, who elicited another standing ovation with her inspiring words. And then it was over. It was done. Weeks of hard work by all involved. One final day, one moment on the stage. I went backstage with the IJB and collected my things, exchanging goodbyes and hugs. I drove home with the IJB and she wandered off, leaving me alone with my thoughts. And my thoughts? They centred on gratitude. Gratitude for the opportunity. Gratitude for being able to share the day with the IJB. 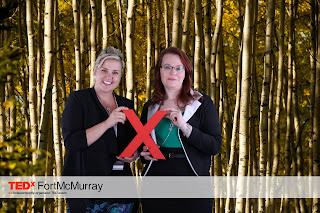 Gratitude for all who worked so hard to make TEDx Fort McMurray happen. Gratitude for an audience of my peers, community members, who seemed to find some value in what I brought to the stage that day. Gratitude for my fellow presenters, who had become friends along the way. Gratitude especially, though, for a few moments in a ball pit with a young woman seeking her place here, and being able to share with her that community is what you make of it, and something you can create. That was perhaps my real gratitude moment, a moment that reminded me of what this journey over the last two years has been about. Summing up the TEDx experience is very difficult for me, as it encompasses so many things from the very personal to the very technical. In the end all I can say is that the journey meant far more than I ever anticipated, and that I believe it has been yet another life-altering experience in a string of life-altering experiences. I cannot wait to share the videos with you soon, so you can see all the presenters and what they brought to the stage that day. And I cannot wait to watch my own video, as my recollection of those twelve minutes is so fuzzy that it will almost be like living it for the first time. What I can say is this: the experience of being a TEDx presenter has changed me. It was another step in a long journey, and it was the kind of chance that humbles me. It brought new people into my life, new ideas – and a new memory of weeks leading up to a day I will never forget. It was one I will keep deep in my heart. It was so much more than a day of “ideas worth sharing” – it was a day of people worth sharing with. Robert Frost once wrote “I took the path less travelled by, and that has made all the difference”. On Saturday I took a path I had never travelled before – and it will, I believe, make all the difference, and forever change my life. It was, in the end, a shift in thought. I decided to tell the story at all.